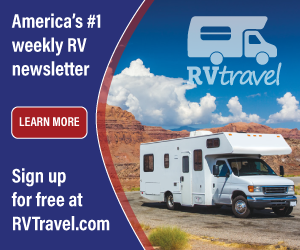 The RV Doctor: An RV Roof Guaranteed Forever! An RV Roof Guaranteed Forever! Hey Doc, I read an article some time back that talked about a new liquid re-roofing product coming onto the market. One advantage of a liquid, is that it may get into all the "nooks & crannies." Any info you can share on this? What is your preference for complete roof protection or re-roofing? I have been reading your articles for many years; they are very informative AND helpful! Thanks! Dr. Bill G.
Dr. Bill, for 40-plus years I’ve investigated many roofing types, coatings, cleaners, preservatives, sealants and other aftermarket products covering the gamut for both RVs and mobile homes. I’ve tested and evaluated many of these products over the years hoping to find that “silver bullet” product that solves many of today’s RV roofing issues. With the roof of the RV constantly being bombarded by airborne contaminates, the never-ending extremes of the weather, ozone, UV attacks from the sun, etc., it’s been an interesting search indeed. That, coupled with the fact that the RV roof is under constant tension and release via the racking and twisting of the structure as the coach moves down the road, it’s no wonder RV roofing leaks develop so easily. It is suggested by many experts that the Number One cause of RV damage is water intrusion and the RV roof is the first line of defense against that. It’s likely the most vital component on any RV. I do recommend Eternabond tape for repairs, component installations and seam protection, but if you're considering the complete roof as a whole, read on. 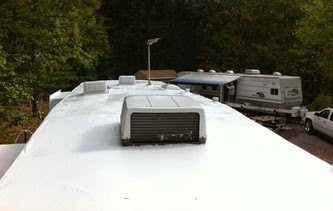 Last year I became aware of a service and process called RV Roof Armor. It’s a two-day installation process whereby the complete RV roof is sealed and protected against leaks forever! It comes with a lifetime warranty that stays with the coach. I’ve personally witnessed a complete installation and I’m now convinced this is the only way for serious RVers to go. Their literature states you’ll never have to go up on the roof again and I firmly believe that. The roof becomes totally locked in from gutter to gutter. And the best thing is that they come to you! No matter where you live (at least in the US), they’ll send their trained expert installer to prepare the coach and apply the surface material; it takes two days per coach. I do have to comment that you’ll not find the attention to detail for preserving a leak-proof roof more so than from their trained staff. I was actually blown away by the completeness of the process. Not bound by time constraints as you’d find in a typical RV service shop, these guys do it right the first time since its on their dime if they have to go back a second time. How many service companies offer a full lifetime warranty on their parts and labor? For a roofing product especially! I can’t remember ever seeing that before! I’d encourage you to bore down deep in their website. Convince yourself this type of service is for you. But I know I’ve found my “silver bullet" when it comes to full roof protection.